Hi guys! It’s been a while since we gave you a wallpaper freebie so today we break the silence and restart the flow of creative awesomeness by bringing you this amazing freebie for October! This month, we feature a stunning artwork created through the photo manipulation style of one of our amazing designer friends – Romel Belga. His amazing style in digital art features incomparable interpretations of various surreal projects through photo-manips, mostly nature inspired showcasing a clash of natural elements like human faces, birds, trees, mountains and the like. Check out his portfolio for more amazing works from this artist. 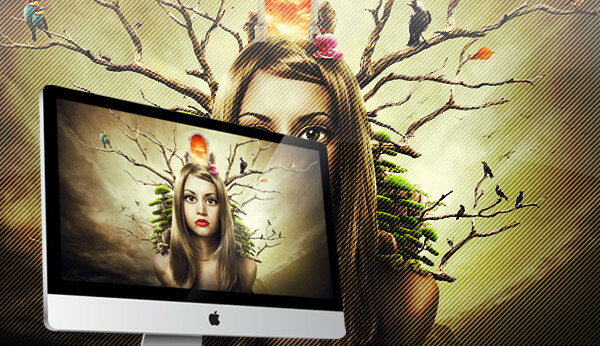 This work is called “Doe Egress“, transformed into wallpapers that can suit up your PC, Mac or iPad. The collection include a wide range of sizes from 640 x 480 up to 2560 x 1440 to perfectly fit your gizmos. Get this amazing wallpaper. Just click the button below. Enjoy and stay awesome everyone! Feel free to tell us your thoughts about this month’s wallpaper by commenting below. .